Most people who have tried cover crops have likely started with cereal rye. It’s fairly easy to establish, is winter hardy, and has many benefits including scavenging nitrogen and having an extensive root system to help alleviate compaction. If you chop silage or have small grains, there are many more options available. 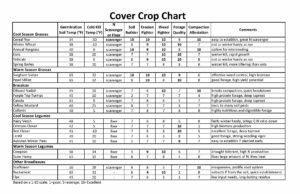 Many producers who have been using cover crops long-term have switched to planting very diverse cover crops if able to plant early (late July or early August). Many cover crop companies sell mixes to meet specific goals. However, you can develop your own mix as well if there are specific goals you’d like to achieve. We prefer to have at least one winter-hardy species in the mix to provide soil protection the following spring. 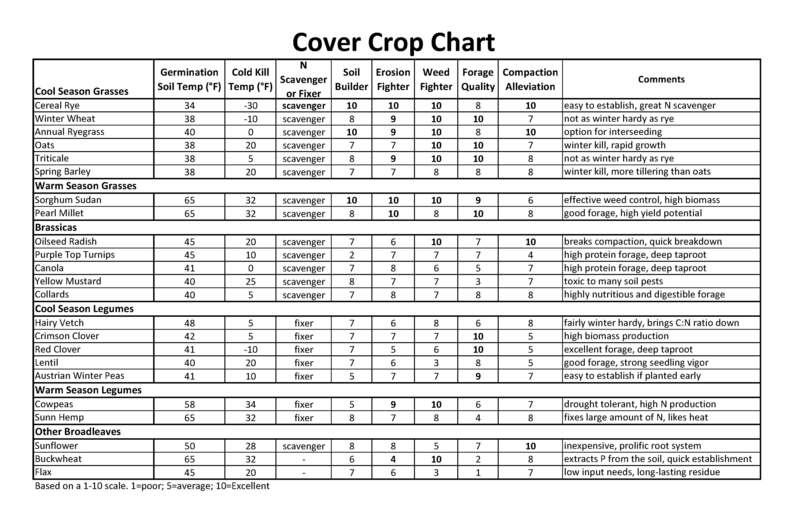 Click on the chart below to see some benefits of different cover crop species and when they need to be seeded. Cost-share may be available to help defray the cost of planting cover crops. Please contact the Allamakee NRCS/SWCD office for more information. Please mention if you plan to utilize manure on the same acres on which the cover crop will be planted as there may be a higher cost-share rate for this practice.